What's better than a flavorful and delicious ZERO calorie sauce? Not too much if you ask us! Tonight we're shredding up lean chicken breast in hot buffalo sauce, and let us just reiterate that it's calorie free ;) Okay everyone, let's just go ahead and make this a low calorie and low carb meal by using our favorite, the crunchy lettuce wrap! We thought we would add another layer of crunch by chopping up both carrot and celery sticks and adding them right into the mixture. The juicy celery and crispy lettuce wrap is the perfect compliment to the hot and spicy chicken.. YUM! This is a super easy meal to make and doesn't require much time in the kitchen! All you have to do to cook up the chicken is simply boil up the lean chicken breast and mix in the buffalo sauce. We choose Franks buffalo sauce, which has a nice and spicy zing and no calories which is truly mind boggling to us... it just doesn't seem possible to taste that good, yet be so healthy! But lucky for all of us, it is! 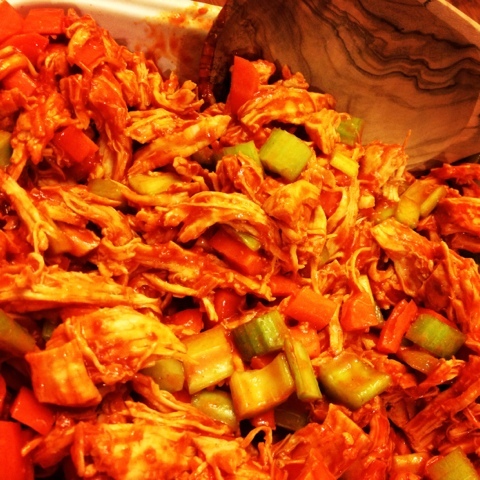 Shred the chicken when fully cooked and mix in both the celery and carrot chunks! 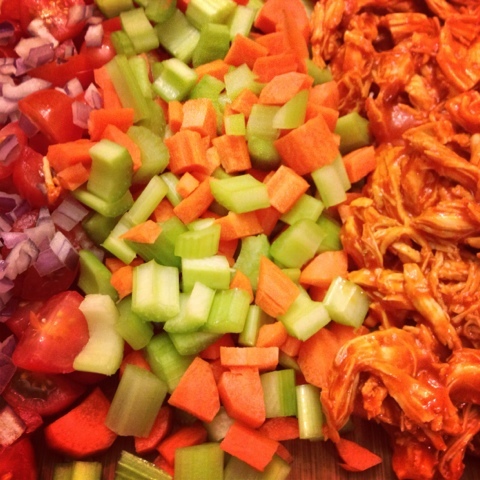 It's lettuce wrap time ;) Pile up the shredded buffalo chicken, carrots and celery right into the cool and crunchy wrap. We topped these wraps with a combination of chopped cherry tomatoes and red onion. This is a meal you can certainly feel good about and we are sure you will enjoy every bite! Hope you like this one as much as we did! 1. Start by boiling up chicken breast for 20 minutes or until fully cooked. Yum!!! I'm definitely trying these out! Just found your cute blog! Love this idea for lunch and love the addition of the lettuce wrap for more crunch and no bread! So happy you found us Sarah :) Thanks so much and hope you enjoy this one! Looks delish! Thank you for sharing with the Clever Chicks Blog Hop this week! Y'all are fabulous! 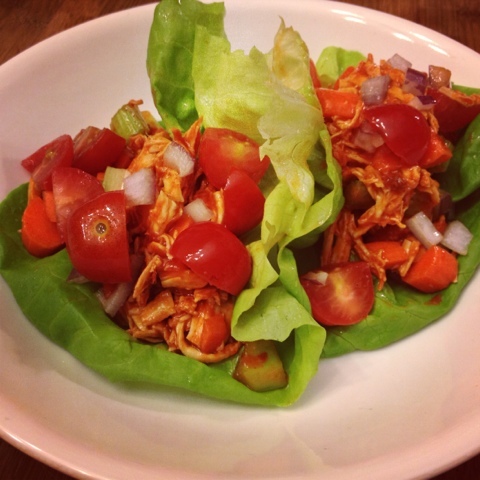 I just came across your blog and am really excited to try the buffalo chicken wraps tonight! Even my husband will love this! Look forward to learning great new things from your blog! !